Black Currant Sage/ Baby Salvia (s. micropylla) - Other common names for this aromatic shrub include Graham's Sage, Little Leaf Sage, and Delta Sage. Widely known as Baby Salvia or Little Leaf Sage due to it's smaller than average leaf size, and commonly called Black Currant Sage in Ireland and the UK so named for it's aromatic leaves reminiscent of the scent of black currants. Whatever you choose to call it, this beautiful and aromatic salvia plant will reward you with loads of reddish/pink blooms from Spring until late Fall and will attract Hummingbirds and butterflies to your garden. Dark purple stems also add visual interest. Prefers full sun but can be grown in partial shade. Forms a small bush approx. 3' tall and 4' wide. 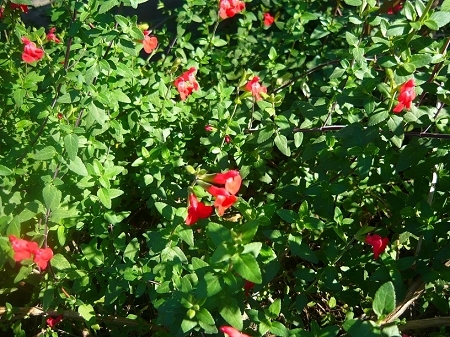 Low water requirements, very drought resistant and tolerant of poor soils. Reported to be deer resistant. Perennial zones 7-10. Live plant in 3 inch container.